Musings on Markets: How much is growth worth? In my last post, I looked at the price being paid for growth by valuing the assets in place in a business. To make this judgment, I assumed that the business would pay its entire operating income to claim holders (as dividends to stockholders and interest expenses to lenders). The value of assets in place then becomes the value of the earnings in perpetuity, discounted back at the cost of capital. Thus, a firm with a return on capital of 15% that wants to grow 3% a year will have to reinvest 20% (= 3%/15%) of its operating income back each year. Investors will thus get less in cash flows up front but have higher cash flows in future years. If you accept the proposition that growth creates a trade off of lower cash flows today for higher ones in the future, you have the three ingredients that determine the value of growth. The first is the level of growth, with higher growth rates in the future generating higher earnings over time. The second is how long these high growth rates can be sustained before the company becomes too big to keep growing (at least at rates higher than that of the economy). The third and most critical is the return on capital you generate on new investments. In fact, if the return on capital generated on new investments is less than the cost of capital, growth can destroy value. The process of valuing growth does get a little more complicated when you set higher growth rates, but the logic and conclusions do not change. If the return on capital > cost of capital, the value of growth will increase as the growth rate increases and the length of the growth period expands. If the return on capital = cost of capital, neither the growth rate nor the length of the growth period affect value and if the return on capital < cost of capital, the value will move inversely with the growth rate and the length of the growth period. If you want to take this concept out for a trial run, this spreadsheet can help you. If you are paying a price for growth, it is always useful to know the value of this growth. If you accept the reasoning in the last section, it follows that it is not growth that you should be paying a premium for but “quality growth”, with quality defined as the excess return you generate over and above the cost of capital. 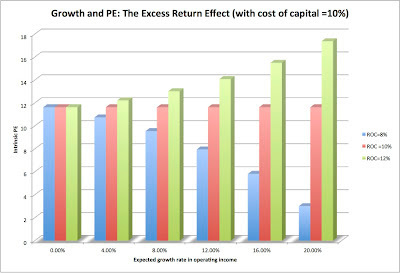 To illustrate this concept, we compute “intrinsic” PE ratios at varying growth rates for three firms, all of which share a cost of capital of 10% but vary in the returns on capital that they earn on new investments (one has a return on capital of 8%, the second has a return on capital of 10% and the third has a return on capital of 12%). The PE ratio for just the assets in place is 11.63 and remains unchanged, even if you introduce growth, for a firm that earns its cost of capital. For the firm that generates a return on capital < cost of capital, the PE ratio decreases as growth increases, reflecting value destruction in action. For a firm that generates a return on capital > cost of capital, the PE ratio does increase (the growth premium) as growth increases. It is this premium that you would compare to what you actually pay to make a judgment on whether the added PE you are paying for growth is justified. a. Price of growth versus value of growth: You can compare the price you are paying for growth with the value of growth, and you come to different conclusions. For Microsoft, where the value of assets in place covers the market price you are paying, the value of growth is a pure bonus. For Kraft, the value of growth is negative, since the firm earns less than its cost of capital, and the price you are paying for growth is therefore too high. For Google, the price of growth is almost exactly equal to the value of growth, making it the only fair priced stock in this grouping. Finally, for Linkedin, the price paid for growth is more than twice the value of that growth, making the stock over valued. For investors who believe in growth at a reasonable price (GARP), this is the statistic worth watching. Growth, in summary, does not yield itself easily to rules of thumb or broad generalizations. In some firms, it can be worth nothing, as is argued by strict value investors, whereas in others, it can be worth a great deal, lending credence to the arguments of growth investors. Enjoy reading your posts. I think there is a typo in the third para "(based upon the return on capital of 15%)" - should that be 10%? I don't think that there is a typo. The cost of capita is 10% but the return on capital is 15%. That is why growth adds value in the first example. Good Post. Do you still come to XLRI sometimes to teach ? have you considered posting your blog as short video clips aka Khan academy? I have never been to XLRI and I am thinking of putting up video clips. Time and hackwork are ingredient in achieving a worthy growth. This is really helpful. I have been trying to think about valuation intuitively for a long time, and this process makes sense. One question, your valuation of future growth in the example, doesn't quite gel to my simple mind with how the spreadsheets calculate the value of future growth. Can you express the equation you use in cell b25 of the growthbreakdown spreadsheet in simple words, so I can follow how the value of future growth is derived? I think what you are doing is calculating a DCF value of total growth ex the intrinsic value of existing assets. But there seem to be more subtractions, and adjustments for time & reinvestment rates that I don't follow. My simple calc for future growth generates a significantly higher value than yours. I am doing((NOPAT*(1-g)/k-g)/(1+k)^t)-intrinsic value..where am I going wrong? Thanks so much. Will make my life a lot easier when I get my head round this. ps I agree with Krystian on the potential error as well, but assumed it was just a typo. I am trying to cram into one cell what you usually do over dozens, but here is the intuition. I am taking the present value of cash flows growing at a constant rate for your high growth period. The equation you see is the present value of a growing annuity, with the annuity being the cash flow after reinvestment needs have been met. You are right. I messed up. Thank you for finding the error. I have fixed it now. In your post May 17th, “Facebook and "Field of Dreams": Hoodies, Hubris and Hoopla”, you wrote that you would recommend a long term sell for the Facebook IPO, but that you still are searching for the most efficient (and least costly) way to execute this. We find it difficult to interpret if you think this is a feasible strategy or not (to short the the Facebook stock from day one and for three years). Could you please elaborate on what you meant? Thanks v. much. Understand were you are coming from now, so can reverse engineer a process. Really enjoy the posts. Thanks again. First, I have realy enjoyed reading your last post (As always). Yet, I must admit that i didn't understand the formula in cell B24 (Value added by future growth). My reverse engeneering was not even close to your figure. Perhaps adding a "Miniature DCF" alongside the formula would help understanding the buildup of that formula. Regarding your last section of yout formula, you assume that the reinvest ratio should be the risk free rate/cost of capital (B20/B19) - Are you assuming that in the long term the Cost of Capital = Return on Capital? If so, what is the rational behinde it? 3. I decided value the Coal Mining Company, Peabody, listed under the Symbol BTU, using your methods. I'm very curious to know what I am missing .... !!! You have a fundamental problem. The growth rate in perpetuity cannot exceed the growth rate in the economy, which in turn should be capped at the risk free rate. Thus, if you let growth in perpetuity become too high, your terminal value will be negative, and more important, you are violating simple rules in mathematics and economics. So, cap your growth at the risk free rate, make reasonable assumptions about ROE in perpetuity and the rest will follow. Yes. I see that. You have summarized my question in one line! I see that the numerator becomes negative. So the result becomes negative !! I can't see where I am violating the rules of economics and IF so which one ? Thanks for the great post! The table summarizing Price of Growth versus Value of Growth is a great tool. There are only two ways that a terminal value can be negative and they are both in conflict with either mathematics or economics. The first is to set the growth rate higher than the risk free rate, which will make the denominator negative. The second is if you set the ROE or ROC way below the cost of capital, in fact, below your growth rate, in which case your firm is contenting to take projects that destroy value in perpetuity. In either case, the problem is not with the terminal value computation, it is with one of these assumptions. And if you are wondering why a firm's growth has to be less than the growth rate in perpetuity, think about what happens to a firm growing at a rate higher than the growth rate of the economy in perpetuity. First, I have realy enjoyed reading your last post (As always). Yet, I must admit that i didn't understand the formula in cell B24 (Value added by future growth)altough my reverse engeneering was close to your figure. Perhaps adding a "Miniature DCF" alongside the formula would help understanding the buildup of that formula. Regarding your last section of yout formula, you assume that the reinvest ratio should be the risk free rate/cost of capital (B20/B19) - Are you assuming that in the long term the Cost of Capital = Return on Capital? If so, what is the rational behind it? I am assuming that the return on capital = cost of capital in perpetuity. To earn more than the cost of capital, you have to have barriers to entry and it is tough to maintain those barriers forever. So, the safest assumption in the terminal value is to assume that the return on capital = cost of capital. And I will add a mini-DCF with the detailed cash flows so that the valuation part becomes more transparent. Based on these input numbers I came up with an intrinsic value of firm of 80 040 in my sheet, whereas your sheet returned a value of 85 044. I also did set up a DCF just to check and this confirmed my number. What I do is that I calculate the total firm value by using the formula of a growing annuity and then add the discounted value of the terminal value. By subtracting the “value of assets in place (1400/0.08 = 17 500) I get the value of future growth (65 540 compared to your (67 544). I’ve been going over the calculations over and over again and can’t seem to find any error which is why I would love to see some further explanations on your calculations, preferably including a DCF. I really like the approach of separating value from growth from value from assets in place. In your first valuation comparison, you assumed that the cost of capital remains the same when you move from a no-growth scenario to a positive growth scenario. n general that is not a fair assumption because changing a business plan to capture growth when previously a company operated with a no-growth plan usually involves taking on more risk. As a result, the cost of capital should be higher in that case, which would reduce your calculated growth value. Excellent point. I did consider allowing for two different costs of capital (it is a simple adjustment to the model) but decided against it in the interests of keeping the inputs under control. Since the excel spreadsheet is an open one, why don't you modify the spreadsheet. As for the prior post, here is why why our numbers may deviate, I think one big factor is what I am assuming about reinvestment. In most DCF valuations, you assume for convenience that growth and reinvestment are contemporaneous. In other words, you assume that you if reinvest 40% and have a return on capital of 20% in year 1, you will have a growth rate of 8% in year 1. In reality, reinvestment has a lagged effect on growth. If you reinvest 20% in year 1, you drive growth in year 2. Thus, I have an upfront reinvestment in time 0 to get growth in year 1 and my reinvestment in my final year of high growth is based upon my stable growth rate. The idea of separating value generated by existing assets from value generated from growth assets has also been addressed in another interesting way. Marty Leibowitz and Stan Kogelman wrote a number of papers (which ultimately got collected in a book) which introduced the Franchise Factor Model. This model decomposes the P/E ratio of companies into a value multiple coming from earnings from the existing book of business and a separate value multiple coming from growth assets that are expected to generate returns in excess of the cost of capital. They define the ability to maintain a positive spread to the cost of capital as a company's Franchise Factor, and the ability to identify and deploy growth opportunities that contain this Franchise Factor is called the Growth factor. The FFM makes clear that growth without a franchise or a franchise without growth creates no incremental value (or equivalently, no premium valuation multiple). The other interesting result from the FFM model is that it is not the perpetual growth rate that matters but rather the present value of all future investment opportunities ( as a % of existing investment. Thus the FFM can account for irregular investment opportunities that come along over time. Thanks for reply. I see what you mean but don't get it exactly right anyway. If u have enough time, of course. That works only if all companies in an economy are stable growth firms. Since some firms are high growth firms, the stable growth firms collectively should grow at a rate less than the growth rate of the economy. Great post professor! It would be interesting to see the proportion of the S&P 500's or the DJIA's value from growth. I wish I had the time to go through this exercise. Growth stock investing is all about buying future expectations. While value investing is all about buying a company thats worth twenty dollars for just ten dollars. I am not a big fan of growth stock investing. What if I own shares in a high growth company thats currently only really worth twentyfive dollars a share but its trading at fifty dollars a share. Whats going to happen to the price of that stock if the future prospects are severely downgraded by analysts. Say growth of revenue and earnings are projected to decrease from 20% a year to just 8% a years. That stock will sell off like a hot potato. How many companies are their that can grow their earnings and revenues by 20% a year for ten years very few indeed. 1. If you assume that return on capital = cost of capital in perpetuity (beyond the high growth period) then any further growth will create no value, so an equivalent assumption when calculating the terminal value is just to set the perpetuity growth rate to zero and assume no further growth reinvestment. 2. Also, if you want to reflect the fact that return on capital is going to be competed down over time because barriers to entry can't be maintained forever, what does that imply for returns on the capital that has been invested during (and prior to) the high growth phase? Aren't you implicitly assuming that capital invested prior to your final period will earn the high initial rate of return into perpetuity? In the spreadsheet it seems as though returns are only competed down on incremental capital invested beyond the high growth phase - i.e. the company seems to enjoy perpetual barriers to entry with respect to certain of its activities (those corresponding to capital invested prior to the final period). Thank you in advance for any follow-up comments you might offer. The real problem when investing in growth stocks is your not buying growth your buying future expectations. How many companies are their out their that can increase earnings and sales by 20% a year for ten years. Very very few. Dear Aswath, thanks for the post. You mention this: "For the firm that generates a return on capital < cost of capital, the PE ratio decreases as growth increases, reflecting value destruction in action. For a firm that generates a return on capital > cost of capital, the PE ratio does increase (the growth premium) as growth increases." How did you come up with this relationship or where is this relationship from or the mechanism by which this relationship comes about? Is there a general equation that calculations value based on PE and ROC? Moody's at PE 15 with ROC 30% is obviously worth more than a GM at PE 15 with ROC 10%. But it becomes unclear to me if Moody's PE is 30 and GM PE is 10. Now which is more valuable? Is there a equation to normalize this problem? Another concept about your Terminal Value that I don't understand is that you use Growth = NetInvestment * ROC. The NetInvestment basically equals TotalInvestment subtracted by Depreciation. Conceptually, shouldn't the growth be tied to the Total Investment? The actual amount of new investment the firm makes is the factor that determines the growth. The depreciation from previous CAPEX shouldn't have an effect on new investments. However, maybe the past depreciation is a good indicator of the "maintenance" re-investment a firm needs to make into R&D or CAPEX to sustain the current rate of profits. Maybe the TotalInvestment should be separated into a maintenance portion and a growth investment portion. My concern is that by subtracting depreciation from the Total Investment, the Terminal Value will be underestimated because the actual amount of money being invested will not be given proper weight. Do you think this concern is legitimate?